When forklifts are the lifeline of your business, it’s important to know and keep track of each aspect of these reliable carriers. You may pay attention to the sound of engine, the way the hydraulics seem to be working or visual signs of any cracks or leaks in the body. Any out-of-place sound or improper movement is also detected easily. But most of the time, the tyres get neglected. How hard do forklift tyres really work? Forklifts lack normal suspension systems that would, otherwise, ease the load off the tyres. They are instead built on a three-point suspension system. It is entirely up to the operator’s ability to maintain the centre of gravity while loading and unloading. No matter how skilled an operator is, majority of a forklift’s load gets transferred onto its tyres, making them pretty vital in the entire scenario. There are many factors associated with tyres that tend to get overlooked apart from their maintenance. Let’s have a look at what these might be. Are your forklift tyres the right ones? From the two varieties of Pneumatic and Cushion tyres, the former is for indoor usage and the latter for outdoor. Though Cushion Forklift tyres work on smooth concrete or asphalt surfaces just fine, if your requirement is for uneven surfaces, switch to Pneumatic. In most cases, companies prefer solid cushion tyres over pneumatic due to minimum break down time which saves time and money. Do note that all types of tyres don’t necessarily suit every kind of forklift. When choosing a tire, check its compatibility with your forklift before making a purchase. 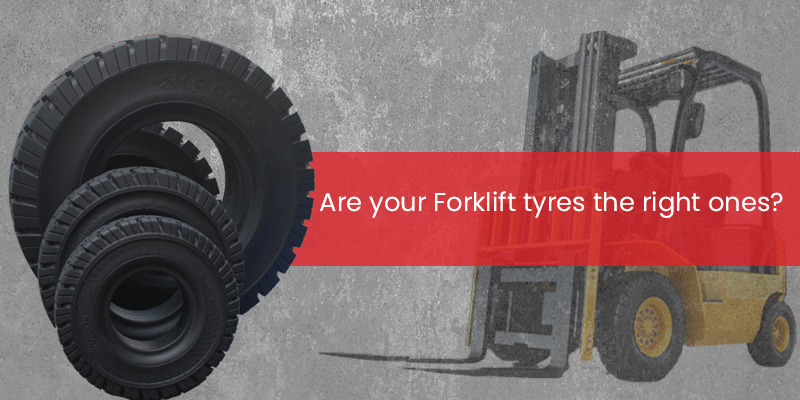 How do you know when it’s time to change your forklift tyres? Damage: This one’s a pretty obvious point, yet, forklift owners keep pushing on with dangerously damaged tyres waiting for the ‘right’ day to come. Any kind of tear or crack is a sign. Balding of tyres, fraying, and even chunks falling off need immediate attention. Operating a forklift with damaged tyres will not only affect the forklift’s performance and fuel usage but is also unsafe for the driver and others on site. Safety Line (60J): Watch the safety line at the side of the tire, if there is one. It tells you how long you should wait before replacing it. To sum up, it’s a good idea to re-check whether the tyres you are using are suited to your needs perfectly. There are many new types being introduced each year. Added to which, regularly assess if the ones you have are in a good enough condition to carry on or do they need replacing. “Stay aware and stay safe”… That’s the motto to follow! Designed by industry pioneers and leaders, Kragos has a strong global reputation for the highest standards of quality, reliability and robust performance in solid tyre offerings. Modern and built using the most contemporary tyre technologies, Kragos solid tyres offer a world of advantages – high performance, cost advantages, efficiency, safety and comfort. Kragos tyre have gained a strong reputation, track record and preference as the solid tyre of choice in almost every continent across the world. 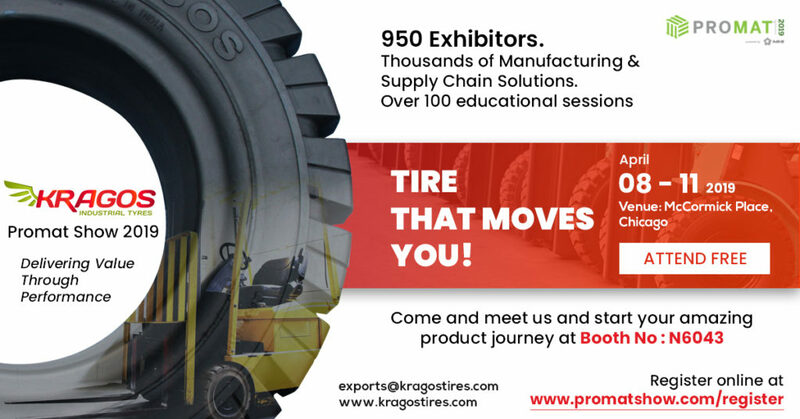 Come, meet us at ProMat 2019 to held in Chicago, USA from April 8 to 11, 2019. © Copy Rights 2019 Kragos Tyres & Industrial Systems All rights reserved.